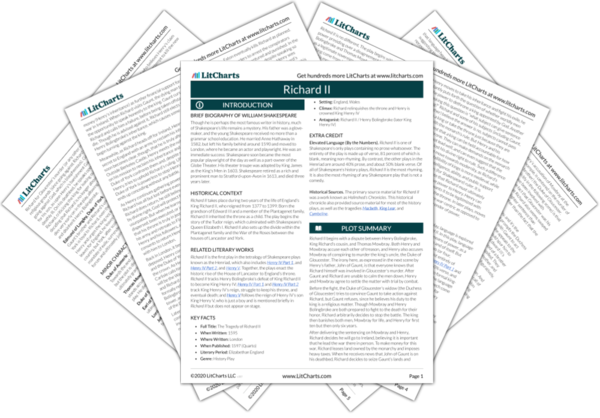 Instant downloads of all 942 LitChart PDFs (including Richard II). New! 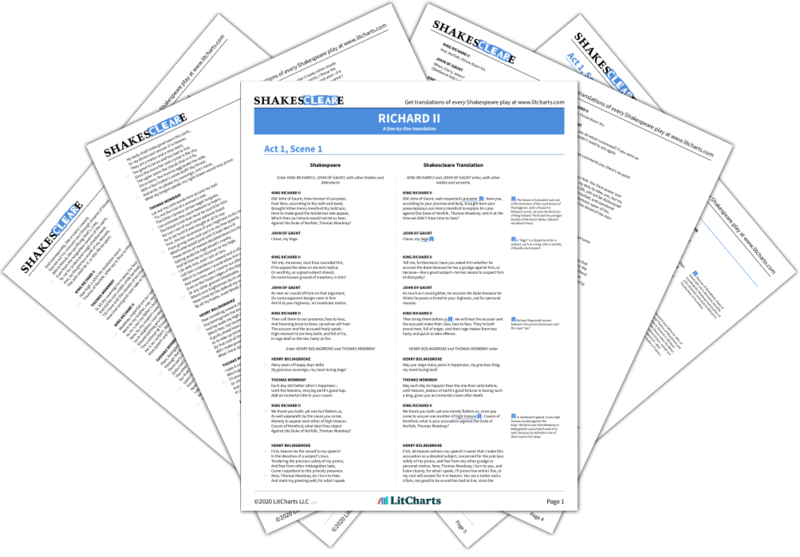 Understand every line of Richard II. 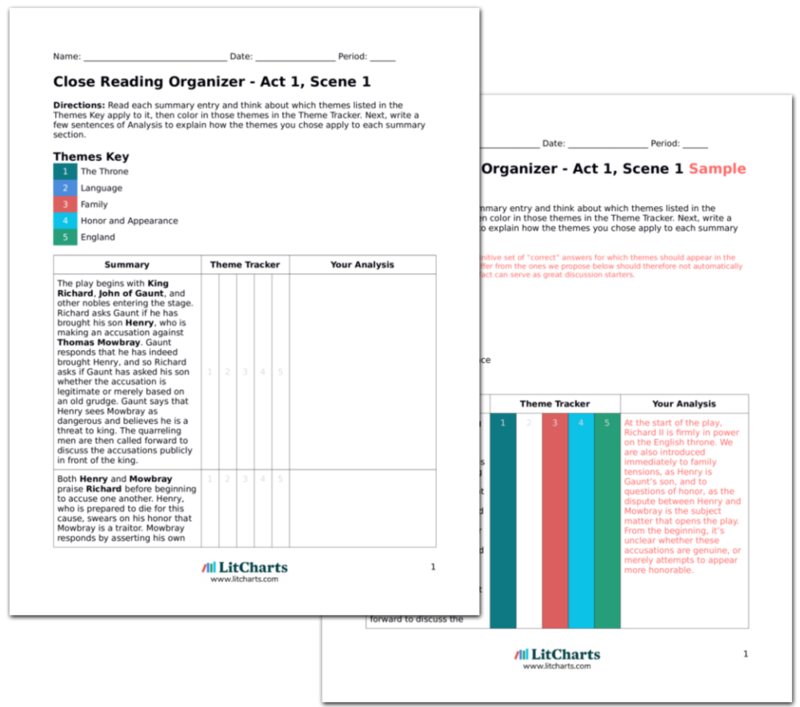 LitCharts assigns a color and icon to each theme in Richard II, which you can use to track the themes throughout the work. The scene begins with Henry recapping the information learned in the previous scene: Richard’s armies have dispersed, and he has met his few allies on the coast. Northumberland reports that it is good news, and that Richard is hiding nearby. York then corrects him, since Northumberland, accidentally or not, left off the title “king” when referring to Richard. York is well aware of Henry’s ambition to take the crown, though Henry and Northumberland here deny it. Northumberland’s language use is essentially a verbal rebellion. Either by accident or by mistake, he does not call Richard king, revealing Henry’s ambition (and Northumberland’s support for this ambition) to usurp the throne and take the crown for himself. However, the two men continue to deny this ambition in order to keep up appearances. Percy then enters and says that Richard is in Flint Castle along with his remaining supporters. Henry instructs Percy to enter the castle and declare that Henry pledges his love and allegiance to Richard, and that he is here to lay down his arms, provided that his banishment is revoked and his titles and lands are restored. If not, then Henry will use his army to take what he wants. Henry simultaneously asserts his allegiance to king Richard and threatens the king. He is able to do this because he is in a position of power; Richard cannot refuse Henry, since he lacks an army to defeat Henry’s. The allegiance Henry pledges through Percy, then, is just a political ruse. Just when Henry completes the message that he wants Percy to send, Richard appears. Henry compares the king to a “discontented sun” that is jealous of the clouds, but York remarks that Richard still looks like a king. Here Henry takes up the metaphor of Richard as the sun, but rather than flattering the king, Henry criticizes him as jealous and appearance-focused. York’s remark that Richard still looks like a king only furthers Henry’s criticism that the king is superficial. Despite the fact that he is overpowered, Richard tries again to assert that he rules by divine right, and that no human can truly depose him. Richard then expresses what Gaunt feared early in the play, namely that by standing up to Richard the rebels have incurred God’s wrath. Richard also puns on “crown,” saying that the thousand heads of children (or just men who are sons of mothers) will change the complexion of England’s face (i.e. die) before he surrenders the throne. This image returns to and reverses a metaphor Richard used earlier about blood rushing from his cheeks as his armies dispersed. 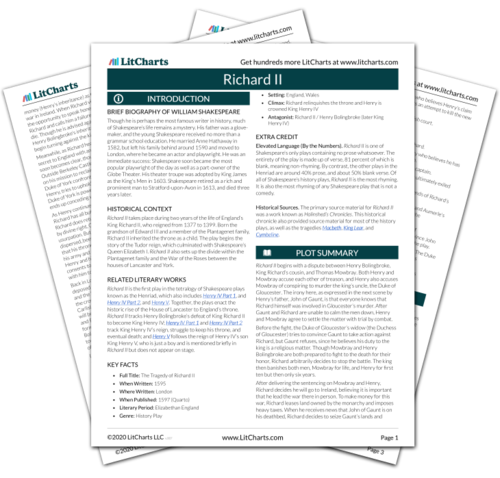 Get the entire Richard II LitChart as a printable PDF. Northumberland responds to this speech in an attempt to placate Richard, assuring him that Henry is bending his knee and only back in England to reclaim what is rightfully his. And though he is afraid that he is debasing himself in the process, Richard agrees to Henry’s demands. Privately, Richard says he regrets ever banishing the proud Henry. He wonders what will become of him and what he must do, and he seems aware that he will soon be deposed. He says he’ll give up all his kingly possessions, including his “large kingdom for a little grave.” By this point, he has completely given in to grief. Northumberland continues the public denial that Henry is in England for any reason other than his inheritance. Richard has no choice but to agree, and privately regrets the critical mistake of banishing and disinheriting Henry in the first place. For all of his proud speeches about ruling by divine right and blood staining England’s grass, Richard is understands that he will most likely soon surrender his crown and his life. When the two men finally stand in front of one another again, Henry kneels before Richard, but Richard accuses Henry of making an attempt to gain the crown. Henry still maintains that he is here only for what is rightfully his, but Richard says that he is willing to give up the crown, and that he will do what he must since he is being forced. Though Henry appears to kneel before the king, Richard knows that in reality, Henry’s ambition is reaching upward for the crown, and that Richard himself is the one who will soon be forced to kneel and fall. Ginsberg, Jacob. "Richard II Act 3, Scene 3." LitCharts. LitCharts LLC, 22 Feb 2017. Web. 20 Apr 2019. Ginsberg, Jacob. "Richard II Act 3, Scene 3." LitCharts LLC, February 22, 2017. Retrieved April 20, 2019. https://www.litcharts.com/lit/richard-ii/act-3-scene-3.